Oh cabbage. How I love this often dismissed vegetable. Practically free at 70 cents a pound, cabbage keeps for weeks and is packed with vitamins and minerals. Though it’s associated with summer slaws, cabbage is available year round at the farmer’s market and equally delicious raw or cooked. 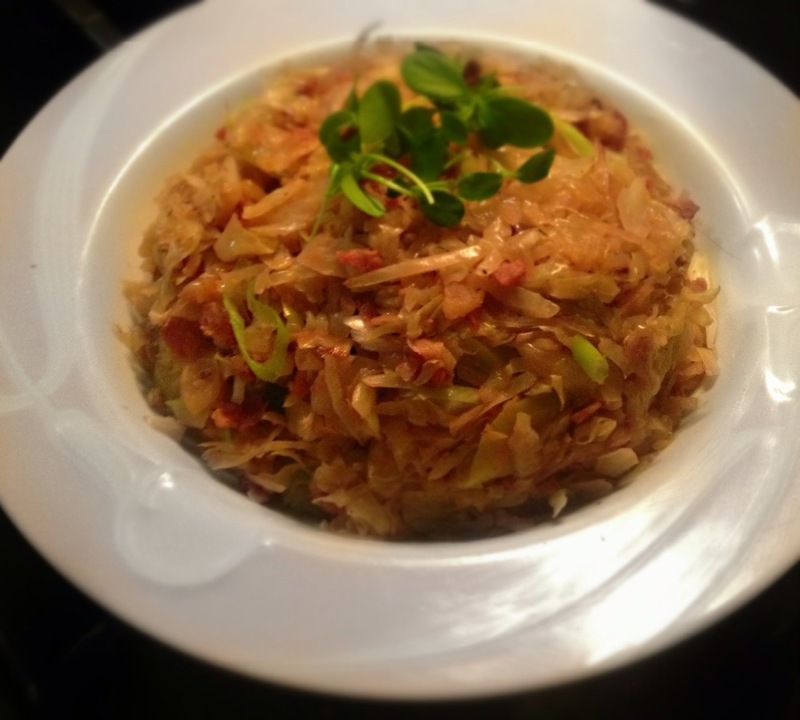 I like my cabbage braised, and here, I’ve wilted it down with guanciale – an Italian cured meat similar to bacon – then paired it with apples and shallots to make true winter dish. Eat by itself, stuffed into tacos, or alongside meat and hashbrowns. Mmm mmm. 1. Drizzle olive oil in a large pot and set heat to medium. Toss in guanciale and cook til crisped. 2. When crisped, remove guanciale and drain on paper towels; set aside. Pour most of the oil from the pot, reserving about a tablespoon or so. 3. Add cabbage, shallots and apples to the pot. Stir in spices and salt and pepper, then cover. Set heat to low. 4. Let cook for about 15 minutes – stirring every couple of minutes – until cabbage has lightly caramelized and is tender. Season to taste and add in reserved guanaciale. Garnish with chives and serve.